1. Third Street, Hinton, Summers County, W. Va.
Third Street, Hinton, Summers County, W. Va.
2. 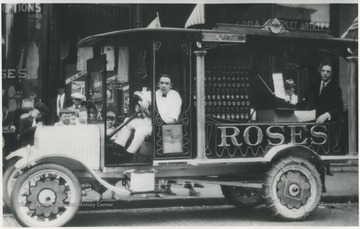 Rose's Drug Store Truck, Hinton, W. Va.
Rose's Drug Store Truck, Hinton, W. Va.
An unidentified man sits behind the wheel of an automobile advertising the store located on Temple Street and 3rd Avenue. 3. Rose's Drug Store, Hinton, W. Va.
Rose's Drug Store, Hinton, W. Va.
Street view of the building located on the corner of Temple Street and 3rd Avenue. 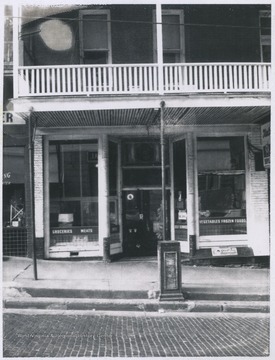 The building burned in 1983 and is now Towne Square. 4. 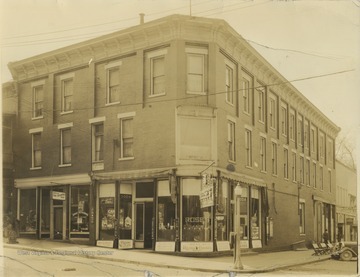 A &amp; P Store, Hinton, W. Va. Inside the store located on the corner of 3rd Avenue, between Ballengee and Temple streets. 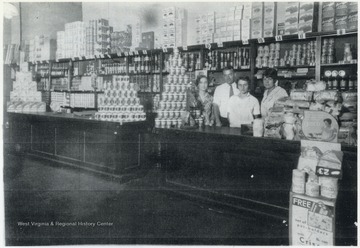 Employees behind the counter are identified, from left to right, as Lorene Jones, an unidentified man, Mary Eades, and Maycle Scott who is the mother of Jack Scott. 5. John Doyle's Market, HInton, W. Va.
John Doyle's Market, HInton, W. Va. 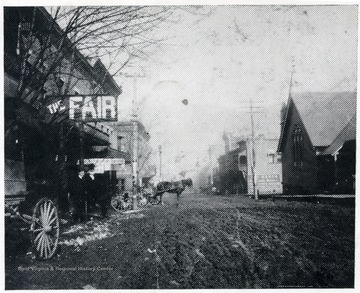 Looking at the store's entrance located on 3rd Avenue. 6. 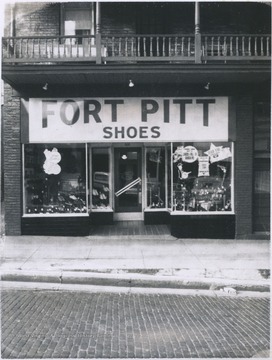 Fort Pitt Shoe Store, Hinton, W. Va.
Fort Pitt Shoe Store, Hinton, W. Va.
View of the store's entrance located beside Doyle's Market of 3rd Avenue. 7. 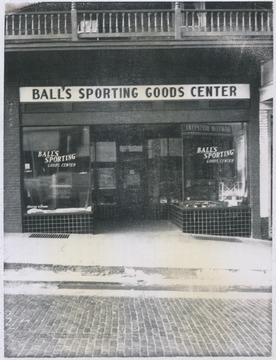 Ball's Sporting Goods Center, Hinton, W. Va.
Ball's Sporting Goods Center, Hinton, W. Va.
View of the store's entrance located on 3rd Avenue. 8. 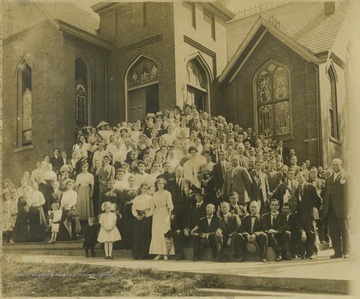 First Methodist Episcopal Church, Hinton, W. Va.
9. 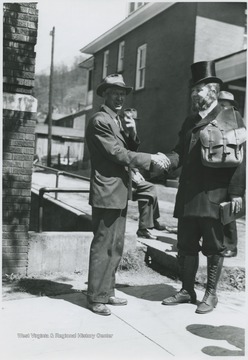 Re-enactment of Methodist Circuit Rider, Hinton, W. Va.
Re-enactment of Methodist Circuit Rider, Hinton, W. Va.
Moorman Parker, right, dressed as the rider for the re-enactment shakes hands with an unidentified man in front of the church located on 3rd Avenue. 10. 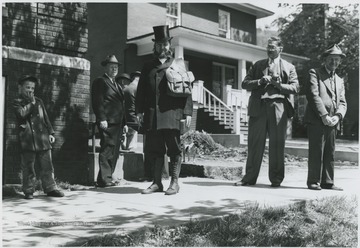 Moorman Parker Dressed as Circuit Rider, Hinton, W. Va.
Moorman Parker Dressed as Circuit Rider, Hinton, W. Va.
Parker, center, prepared for the re-enactment of the Methodist preacher circuit rider next to the church located on Third Avenue. Other subjects unidentified. 11. 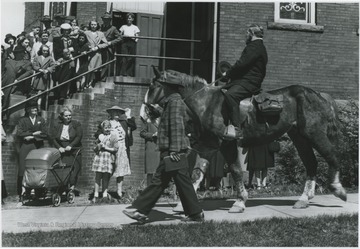 Re-enactment of Methodist Preacher Circuit Rider, Hinton, W. Va.
12. 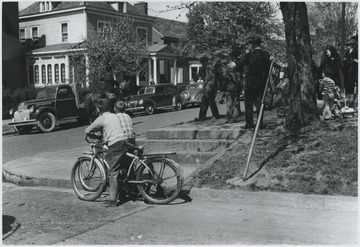 Moorman Parker Re-enacting Methodist Preacher Circuit Rider, Hinton, W. Va.
Moorman Parker Re-enacting Methodist Preacher Circuit Rider, Hinton, W. Va.
A group of spectators watch as Parker re-enacts the circuit rider next to the First Methodist Church building located on the corner of Ballengee Street and Third Avenue.